New Delhi, 30 September 2018: Hockey India on Saturday named a list of 48-member core probables for the Indian Women's Team National Camp to begin at the Sports Authority of India, Bengaluru Campus on October 1. The members of the National Camp, that concludes on 27 October, will report to Chief Coach Sjoerd Marijne. The Core probables list, that includes members from the recent 18th Asian Games Silver-Medal winning team, also features top performers from this year's Hockey India National Championships. 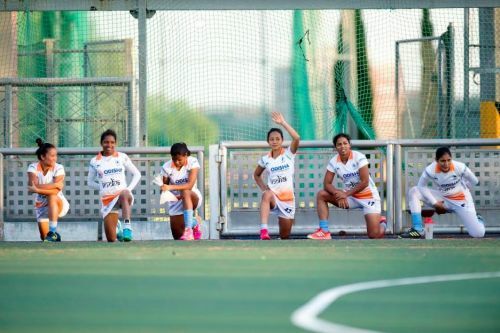 Among forwards, skipper Rani, Lalremsiami, Navneet Kaur, Navjot Kaur, Rajwinder Kaur, Vandana Katariya, Anupa Barla, Priyanka Wankhede, Preeti Dubey, Reena Khokhar, Siddhi Singh, Leelavathy Mallamada Jaya, Soundarya Yendela and Birajani Ekka have been asked to report for the camp. The Indian Women's Team have ended the season on a high note after an inspiring performance at the Gold Coast Commonwealth Games where they finished fourth, were runners-up at the Asian Champions Trophy in Korea, made it to the top eight at the Women's World Cup in London and won a Silver Medal the recently-concluded Asian Games in Jakarta. These memorable feats also helped the Indian Women's Team surge ahead in the FIH World Ranking where they jumped up to a career-best rank of No. 8. Chief Coach Sjoerd Marijne said, "We will be watching each of these players closely during this camp and see how the competition is within the group. We will be seeing how the players especially the newcomers can cope with the expectations of a National Camp. The seniors too will have to work hard to earn their place in the core group." Marijne further added that the focus of this camp will be on strength and conditioning with emphasis on some of the senior players put through rehab and recovery after a long and testing past few months with back-to-back events. "Some of our senior players have played continuously throughout the year and naturally they will be carrying some niggles from playing back-to-back events so this camp will also help these players in rehab, recovery and improving overall fitness," he said.